1. Choose your colors from the Color Selection page. Base price for the Performance Hybrid Nylon Whip design pictured below is $170 plus $9 USPS Priority Mail shipping inside the US. A matched pair is $330 (includes $10 discount) plus $12 shipping. The synthetic handle base (pictured below in black) is currently only available in black, white, dark green, dark brown, or red. Your choice of one whip or a pair of whips. In the spirit of the design of this whip and to help encourage two-handed whipcracking, there is no extra charge to make your two whips a matched pair – in fact, if you order a matched pair, the second whip is $10 less. Your choice of colors for the parts of the whip(s) below. Please use the names of the colors as listed on the Color Selection page. Your planned payment method (acceptable payment methods include Paypal, personal check, or money order. Please make all checks payable to Lauren Wickline or Paul Nolan). Available payment methods include Paypal, personal check, or money order. You may pay upfront if you would like, but we don’t require payment until we are ready to begin on your whip(s). We will send you an email to let you know when that time comes. If we don’t have your color(s) in stock, we may ask for your payment a few weeks before we are ready to start on your whip, to give our supplier time to ship your color(s) to us. We work on these whips in the evenings after our ‘roo hide whipmaking work is done for the day, and they don’t take as long as our kangaroo hide whips to make, so the wait time is generally shorter than it is for our kangaroo hide whips. However, we have been receiving orders for the PH whips faster than we have been able to make them, so there will be some wait. If you live in the continental US, standard shipping is USPS 2-3 day Priority Mail and costs $9 for one whip. Shipping is $12 for a pair. If your shipping address is outside the continental US, shipping methods and prices may be discussed privately via email. All whips are shipped with the thong and handle as two separate pieces. 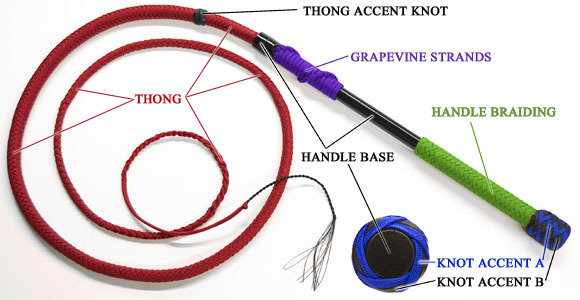 Easy-to-follow illustrated instructions for how to attach the thong to the handle using the French Grapevine (pictured to the left) are included with each whip. Trust us, it’s super easy. But if you have trouble or would prefer an even simpler attachment method, we also include brief instructions for how to tie your thong on the traditional Florida cow whip way with a series of regular overhand knots. If you are interested in ordering a replacement thong or would like to inquire about pricing and availability of a custom PH design, please contact us directly at PerformanceHybrid@midwestwhips.com. but every time i am trying to send it’s fail…. it’s there another way can Contact you ?! How much would a pair of all black 5ft ph whips and 1 all black 8ft ph whip be? David, the current price (March 2012) for a matched pair of solid black standard 5ft PH whips is $280, not including shipping. We do have a pattern worked out for up to 8ft versions, but those are custom orders – and we don’t generally recommend the PH style of whip to be that long because they are so light and best suited for Australian style cracking. Send me an email (performancehybrid@midwestwhips.com) if you want to discuss a custom order with an 8ft. Do you have any phs in stock or do you just send an email with what you want? Sometimes we might have a pair or two of PH Whips in stock. To check, visit our IN STOCK page at http://www.midwestwhips.com/InStock.html and if you have been there before, hit “refresh” on your browser to make sure you’re viewing the latest version of the page. If you want to order a PH whip (or two) in the colors of your own choosing, just send us an email with the information as requested on this page!